When you want to express that you've been swept off your feet by your one and only special someone, consider showing it with this graceful 14K yellow gold pendant! Two difference but complimentary halves combine to create a united emblem of love. The right side of this heart is formed from an elegantly-curving line of diamonds, while the left side is crafted from a swish of shining gold, curling like a golden lock of hair blowing playfully in the breeze. 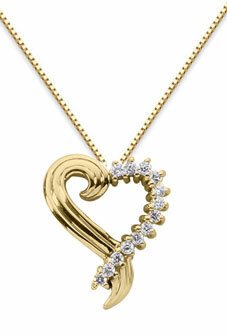 We guarantee our Diamond Swirl Heart Necklace, 14K Yellow Gold to be high quality, authentic jewelry, as described above.